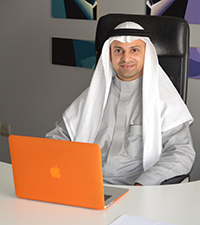 Dr. Shadi Bin Fouad Khawandanah - Chairman of the Board of Special Direction Group. He has started-up more than 12 successful companies in the ME & Europe. His background includes entrepreneurship, business innovation, organizational leadership, and strategic management. Dr. Khawandanah is an approved and accredited business consultant by the Saudi Ministry of Commerce and Industry. He is also certified in strategic management from Harvard. Dr. Khawandanah has established, in 1999, the group of Da’awah Friends to promote the Sunna of Sayyiduna Mohammad Peace Be Upon Him, targeting the Muslim youth. Over the past 15 years he had introduced more than 150 projects and activities that focus on improving the ethics, attitude, morals, and abilities of the Muslim youth. One of the projects was “Zamzemha Wa Tawakkal”, the goal of this project was to link the intention to drinking Zamzam water, over 1,000 members of Da’awa Friends Group were working for years on this project by distributing artistic cards that show the value of Zamzam and water the people Zamzam water in very modern cups. In the same time, they were explaining to the target audience the relationship between Zamzam and the intention. This project was introduced in hospitals, schools, universities, malls, beaches, etc. Thousands and thousands of people have benefited from this project and asked to apply it by themselves to their own societies. With total pleasure, Da’awa Friends Group has welcomed the initiative and supported them with the artistic cards, Zamzam water, as the required training for their presenters. Another initiative that was lead by Dr. Khawandanah, was supporting the Syrian Refugees in Jordan and Lebanon. He has visited hundreds of families and provided tents, water kettles, heaters, blankets, and clothes to them. In addition Dr. Khawandanah was presenting value added and social responsibility programs at local and international schools, institutes and universities to share his valuable knowledge with the society. Dr. Khawandanah was given the authority to lead the health care team during Jeddah Flood in 2010, he has managed to save life of hundreds of people and treated more than 10,000 injured people. At that time, he was managing a team of 200 doctors, nurses, pharmacists, and social workers. In addition Dr. Khawandanah, has presented hundreds of workshops and presentations in many embassies and consulates, i.e. the American Embassy in Saudi Arabia, the Egyptian Consulate in Saudi Arabia. He also led so many entrepreneurial programs with the chambers of commerce such as the Italian Chamber of Commerce, Hungarian Chamber of Commerce, Dubai chamber of commerce, and many others. Along with that, Dr. Khawandanah introduced new HR models at the society of Human Resources Management (SHRM) and the Arabian Society of Human Resources Management (ASHRM). With the Council of Saudi Chambers (CSC), Dr. Khawandanah was presenting The Saudi Business Men Delegation in Hungary. The trip was to meet the Prime Minister & the Speaker of the Parliament to build strong business relationships between both countries. He also presented The Saudi Business Men Delegation in Portugal to meet the President of the Portuguese Republic o promote the Saudi businesses and to encourage the trading between both countries. Along with that, Dr. Khawandanah presented The Saudi Business Men Delegation in Italy to meet The Minister of Foreign Affairs to capitalize on the diplomatic relationships between both counties. In addition, he presented The Saudi Business Men Delegation in USA at the US-Saudi Business Opportunities Forum to join ventures between the American-Saudi businessmen. Recently, Dr. Khawandanah was invited by the project management institute - Arabian Gulf Chapter PMI-AGC to present an entrepreneurship presentation at the Islamic Development Bank (IDB), and he has highlighted the highly valued entrepreneurship mechanism of the great entrepreneur Sayyidina (Ameerul-Mumineen), Uthman Ibn Affan (may Allah be pleased with him). As Dr. Khawandanah is a steering committee executive member of the Middle East Partnership Initiative MEPI, he is prioritizing Women’s Civic Participation with the new/ future projects to develop the leadership abilities, organizational and management skills of current and up-coming women civic leaders. He stands ready to help women develop the capacity to take advantage of new opportunities for civic participation. Also, he is working on creating many innovative programs to support the entrepreneurs in the region, and to create more jobs. In addition, he is working on a very big plan to establish a leading Saudi manufacturing and distributing company of high quality dates products that will produce and export high quality dates products using modern technology to provide high satisfaction to the international consumers i.e. USA & Europe. The objectives of this company are, to promote the value of the dates, provide the customers with the quality products as well as, to create price competitive products as part of the effect to increase the world access to high quality dates, to empower the youth by training them in the dates industry. This company will enhance the recruitment of women as the dates industry complies with the cultural needs, promote the Islamic exporting products internationally with a very high quality image. And to capitalize on the national diversified portfolio of exporting business. As a CSR program, Dr. Khawandanah will be releasing in 2015 a Mobile Management Application, (Blood-up), to facilitate the request and the collection of blood. The features of the application focus on providing geo-located donation center, including blood donation vans, reporting donation centers nearby, push notifications, notification for emergencies situation, a test on “who can donate?’’, statistic about percentage of blood donation, information on how to maintain your health, an online game with premiums scores for donors. One of the main objectives of the application is improving the communication between donors and other users. Moreover, it also designed to handle emergency situations by notifying donors of the same blood group if accidence nearby occurs. Another element is that it could promote blood donation amongst the young generation through the entertaining and competitive game. Additionally, users can contribute to fund the application by purchasing the add-ons through the game. The social benefits of achieving these objectives would result in international scale as they strengthen the database of donors, create jobs through the awareness campaigns, create a strong network and direct channel of communication for blood donors. Dr. Khawandanah believes that it is all about saving life, In Saudi Arabia, 0.5 million people would die each year without life saving blood transfusions, and 3 millions in a country like USA and every three seconds someone needs blood, also one out of every 10 people entering a hospital needs blood. Finally, Dr. Khawandanah is creating a mentorship program that he will manage by himself to develop and train entrepreneurs in the region. Along with that he is continuing to develop some more projects for Da'awah Friends Group, and developing more and more workshops/ conferences to all the societies that were mentioned earlier in an international scheme.